Sri Lankan opener Dimuth Karunaratne, who was rushed to a hospital after getting hit on the back of the neck off Australian pacer Pat Cummins' bouncer, has been discharged. Sri Lankan opener Dimuth Karunaratne, who was rushed to a hospital after getting hit on the back of the neck off Australian pacer Pat Cummins’ bouncer, has been discharged. “Dimuth has been discharged from Canberra hospital following assessment and all cleared. A further update will be provided on his playing status tomorrow prior to play,” ICC quoted the statement issued by Cricket Sri Lanka, on Saturday. Earlier in the 31st over on the second day of the Canberra Test at the Manuka Oval, Cummins’ angled bouncer was clocked at 142 kmph and in spite of Karunaratne’s attempt to move away from the line of the ball he could not evade it. 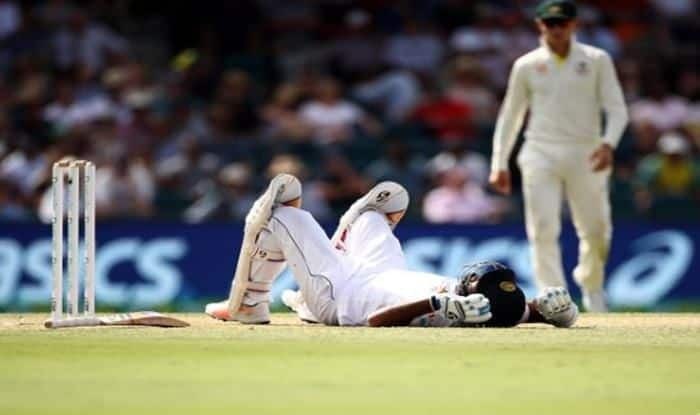 Karunaratne fell to the ground and received immediate treatment from the medical staff of both the teams. He was put in a neck brace, stretchered off the ground before being rushed to the hospital. Karunaratne scored 46 runs off 84 balls before retiring hurt and carried his side to 82 for no loss of a wicket. Following the incident, Sri Lanka finished the day on 123 for the loss of three wickets, trailing Australia by 411 runs.